NEW YORK, NEW YORK – April 24, 2018 - GameChange Solar announced today that it has completed a 1.4 MW Standing Seam system that was recently installed in Sterling Massachusetts to support 4,080 REC silicon modules. The solar system was married to in-building energy storage solution to provide the type of combined energy plus storage system which is rapidly gaining traction as a preferred customer solution for significantly improved project return on investment. 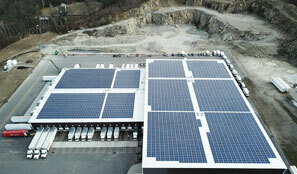 The system is owned by Origis Energy USA and built by Alten Energy. Yarel Cruz, P.E., Project Manager at Alten Energy stated: “GameChange's Standing Seam rooftop system is a great product. It is easy to install as the rails are light and it has a compact design. This racking system is very convenient for mobility and storage at the site. I would definitely recommend this product, especially for projects on large roofs like the Sterling Community Solar + Storage."